How to make pizza dough like a pro. Making pizza dough like a pro is a science. 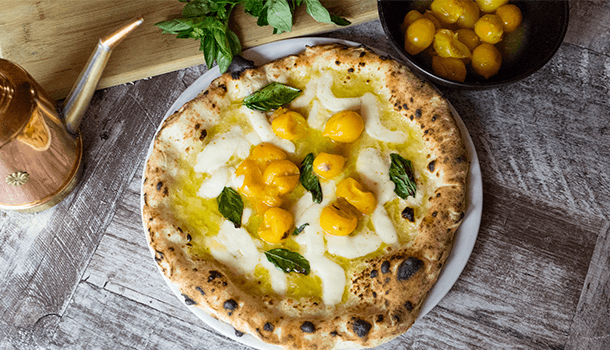 This Pizza dough recipe, shows off the authentic technique of how to make Neopolitan-style pizza dough by one of the masters, Francesco Spataro of Apertivo Restaurant in Sydney. 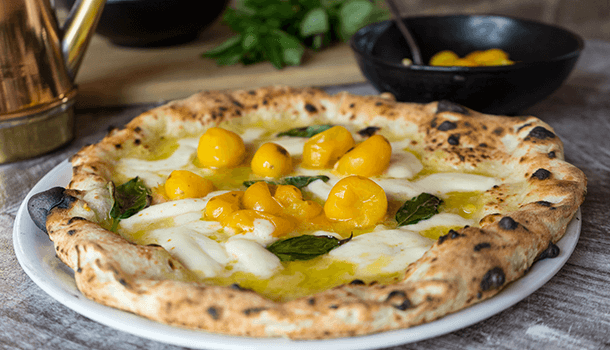 It’s all in the hands, the temperature and the resting time – and in this case, golden yellow cherry tomatoes, hand picked from Mt Vesuvius in Naples, Italy. 1. To make the pizza dough like a pro, start by pouring 1 litre of water in a mixing bowl. 2. Add 50g of sea salt to the water and stir with your hands to help it dissolve. 3. Sprinkle in 10% of the flour, using your hands, and stir once again. 4. Dissolve 1 tiny gram of yeast into the water, making sure to do this in order so that the yeast does not come into contact with the salt. 5. Slowly incorporate more flour into the bowl with one hand, and move the bowl around with the other. Continue this process, to make pizza dough like a pro, until you have used all the flour. 6. Once the pizza dough has incorporated to make a mass, transfer it onto your bench. 7. Begin to knead the dough on the bench, folding the sides in and pressing down, then turning the ball as you work it. 8. Continue Step 7 until you have a beautiful soft ball – to test if it’s ready, poke your finger gently into the ball. If it rises back up, it’s PRONTO! 9. Put the ball into a mixing bowl and cover it with a wet towel or some plastic wrap and leave it to rise for 2 hours. PIZZA CHEF TIP: Let the balls rest for between 16-28hr for best results – anything longer than this is not necessary. 11. When the pizza balls have risen, take one of them and put it on your bench. Gently spread it out using your hands only. You will see that there is “gas” in the dough and you must make sure this remains, so don’t roll it out using a rolling pin, use your hands. This part of the dough is the key to forming the crust! 1. 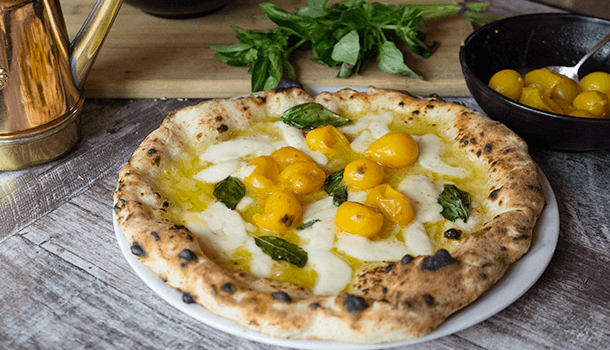 If you can get your hands on golden cherry tomatoes from Italy – use them! Otherwise, use juicy, ripe, red ones instead. 2. Put your cherry tomatoes into a bowl and press down on them using a fork and mixing them together to get some of the juices out. 3. Take a spoon and scoop up some of the tomato juice, pouring it on to the pizza base and start to spread it out. 4. Continue until you have lightly covered the pizza base, being careful not to cover the crust. 5. Add a few cherry tomatoes on top, along with strips of fior di latte mozzarella cheese. 6. Add some fresh basil leaves on top, a pinch of sea salt and a drizzle of EVOO. 7. Stretch out the ends of the pizza and pull it on to a large paddle. 8. 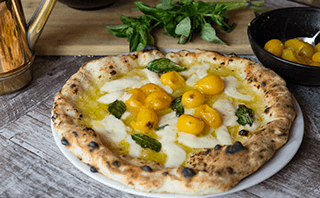 To make this dough the most authentic way, it must be cooked in a woodfire pizza that has been heated to between 400-450 degrees celcius, for no more than 2 minuutes. 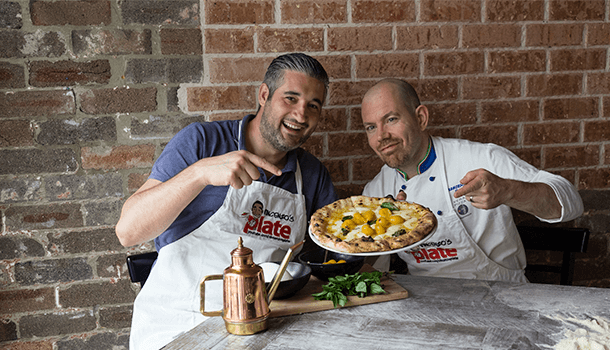 E ora si mangia, Vincenzo’s Plate….Enjoy!